Should I care about Chroma Squad? If you’re struck by devastating waves of nostalgia every time you think about Power Rangers, Japanese super sentai series, or, er, Backstreet Boys lyrics, then yes. Definitely yes. What’s it about? 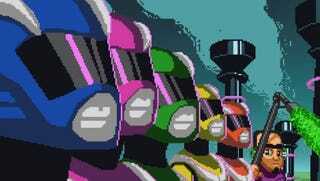 It’s a Power Rangers (sans the license) strategy game, but that’s not all it is. See, there’s this whole meta layer to it. You’re actually managing a fledgling TV show about a multichromatic super team that battles everything from powerful wizards to cardboard boxes with boxing gloves. Episodes of your show take the form of turn-based strategy battles (think Final Fantasy Tactics or, on the more Western side of things, XCOM), but with special objectives from the director on a per-episode basis. So you might, for instance, need to attack the boss with a certain character before calling over the whole team for a snazzy, flamboyantly posed finishing move in one episode, but another might task you with rescuing someone in a certain number of turns or doing a bunch of cool flips. These objectives are not mandatory, but they make fans like your episode more. Fans, then, are the duct tape that hold the two sides of the game together. Well, that and money. Imagine, like, a sandwich made of violence, money, and people. And the people are screaming at you, constantly, angrily, between each and every bite. Doesn’t that sound delightful? That’s Chroma Squad. Seriously though, there’s light management between episodes. Buying new equipment for your studio (with the money your most recent episode pulled in), customizing your heroes—those kinds of things. You get to see reactions from your fans at the end of each episode via a Twitter-like service, too. It’s really cute. Why is (or isn’t it) cool? It’s a fun, funny fusion of sentai tropes and solid strategy. Those components might sound at odds with each other, but they Voltron together beautifully, forming a rainbow robot of joyous possibility (and, to quote my customized in-game squad slogan, “MURRRRRRRRDER”). Just a couple simple examples: your characters start each scenario in their superpower-less civvy skivvies, but if you wail on enough baddies, you get a rad transformation sequence. Also, each of your squad members can enter a mode called “teamwork” at any given moment, which enables them to assist other nearby characters. This can mean anything from letting them cover more ground by acting as a human trampoline for viewer-friendly stunt jumps to sealing the deal on a full-team finishing move after everyone else has entered teamwork mode around the same foe. Those moments are super satisfying, especially after you’ve managed to corral an especially hard to wrangle boss. Oh, bonus points for some serious diversity in the cast. From men and women of all sorts of different backgrounds to aliens and robots, there’s pretty much no way you won’t find a character or two you’re all about. You get to select your whole squad too, so go nuts. Sounds pretty sweet. How in-depth is the strategy? I’ve only played a couple hours, so I can’t say for sure. It feels pretty light to me so far, but not in a bad way. Chroma Squad seems more focused on being fun and charming than brutal or hyper-versatile. Then again, I’m also playing on normal, not hard. That said, it still makes some classic strategy mistakes. For instance, I went from a super basic tutorial (here is how to move, here is how to attack, etc) to a screen where I had to select my full roster of characters based on stats, classes, and abilities the game had told me next to nothing about—let alone help me understand by, I don’t know, allowing me to try them out. You can put a pretty wide range of characters into each class slot too, so I might have chosen awful characters for each job and not known it. Hell, I still don’t know if I shot myself in the foot (or pummeled it until it theatrically shouted, “noooooooooyouhaventseenthelastofmeeeee” and exploded, as it were) yet.